Nestled down a quiet lane in the North Seminyak / Batu Belig area, Villa Verde is a ten minute stroll to the beach, walking distance to restaurants and a five minute taxi ride to renowned Seminyak restaurants such as Sardine, Metis, Sarong and the famous Potato Head Bar. With only a twenty minute drive to Kuta and a twenty-five minute drive to the airport, Villa Verde is well positioned in this highly sought after Seminyak area. Villa Verde is a luxurious, self-contained and private two-storey villa that meets the highest standards of quality for private holiday retreats. The villa consists of three large bedrooms, four bathrooms, two living areas and a full size western kitchen. 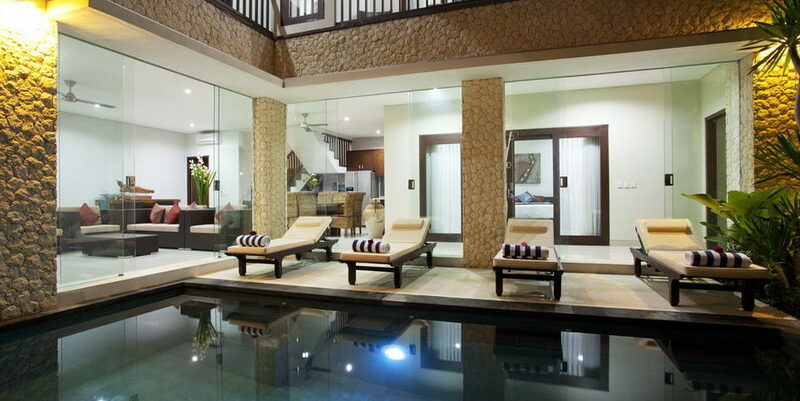 The villa is of a contemporary / tropical design and is privately owned. Within the secluded, walled property, a tropical garden, beautiful waterfall and crystal clear swimming pool is featured. With ample reclining sun deck chairs and a bale for reading, relaxing or enjoying sunset drinks, you are sure to relax and enjoy an unforgettable Bali villa experience at Villa Verde.